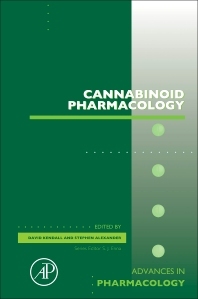 Cannabinoid Pharmacology, Volume 80 is a new volume in the Advances in Pharmacology that presents reviews of recent breakthroughs. This volume aims to present current knowledge of the endogenous cannabinoid system, and looks at molecular, cellular, tissue and organismal effects of endogenous and exogenous cannabinoids. Topics of note in this new volume include Endocannabinoids and their congeners, Endocannabinoid turnover, Plant cannabinoids, Synthetic cannabinoids and ‘legal highs’, CB1 and CB2 cannabinoid receptors, Novel signaling modalities, Novel cannabinoid receptors, and Ion channel regulation by cannabinoids. There is a broad coverage of the essential elements associated with the cannabinoid system. The Editors have sought to include authors who represent authoritative voices on these themes, but have not previously worked together to allow a fresh approach to the individual aspects covered. David Kendall has had an active interest in cannabinoid research for over 20 years focussing initially on endocannabinoid signalling in the vascular system and latterly in its roles in pain. He was Professor of Pharmacology in the University of Nottingham Medical School until 2015 before taking up the position of Chief Scientific Officer for the drug discovery company PharmNovo. Dr Stephen Alexander has been interested in the regulation of mammalian cannabinoid systems since the first identification of an endogenous cannabinoid molecule in 1993. He has principally focused on the enzymes associated with the hydrolysis and transformation of these endocannabinoids, both in terms of establishing high throughput assays for these enzymes and also in quantifying their activities in tissues ex vivo. He is an Associate Professor of Molecular Pharmacology at the University of Nottingham, Chair of the Nomenclature Committee of the International Union of Basic and Clinical Pharmacology and has been President of the International Cannabinoid Research Society.